I have given up on spelling. The names are not correct and it is the tablet on permanent hell autocorrect. Milla, not spelled correctly, was a vast and important city with thousands of inhabitants. 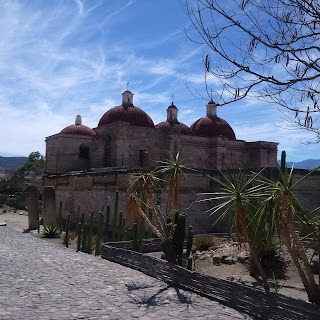 It was a mixture of the Mixtec and Zapotec indigenous nations that live near Oaxaca city. They built their sophisticated structures without mortar so that were earthquake proof. Like the AK 47 gun, the buildings shake off dirt and the stress of shock allowing them to stand the test of time. You rattle but you have latitude, so you don't fall. 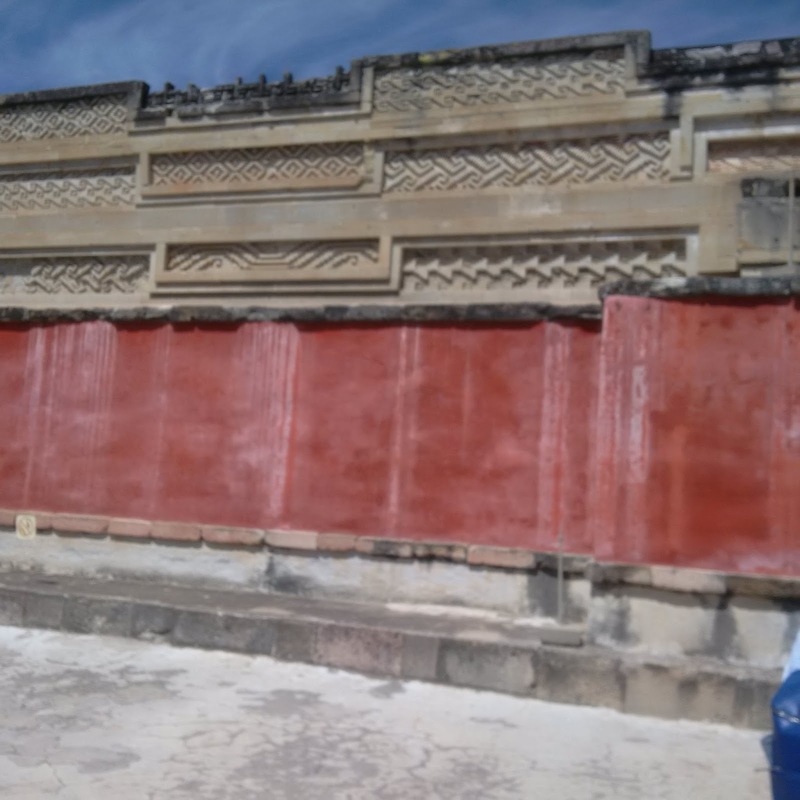 When the conquistadors arrived in mitla, the only people left were Zapotics, all the Mextics were gone. Where did they go? The Aztec who I have already discussed, apparently decided to just kill them all. 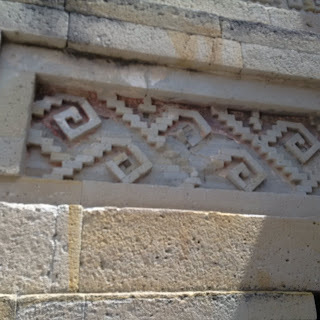 Meaning the Mextics, for what reason our guide did not know. But we do know the Aztec really, really liked to kill people. When I as a child pondered on how the great Aztec empire was defeated by some 700 grubby Spaniards. No one told us about the 100,000 indios who hated the Aztecs and thought it would be a good alliance to join with filthy men with horses, armour and frightening guns. However liberation was not at hand. Our guide an indigenous Zapotic from took us to the glorious abandoned monk fort outside of mitla. 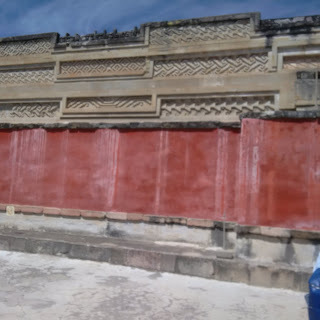 After the Aztec fell the Dominican monks came in droves to Nuevo espana and within a mere 4 years of the conquest had now enslaved the indios and forced them to start building the great and holy edifice we see today. It really is breathtaking. 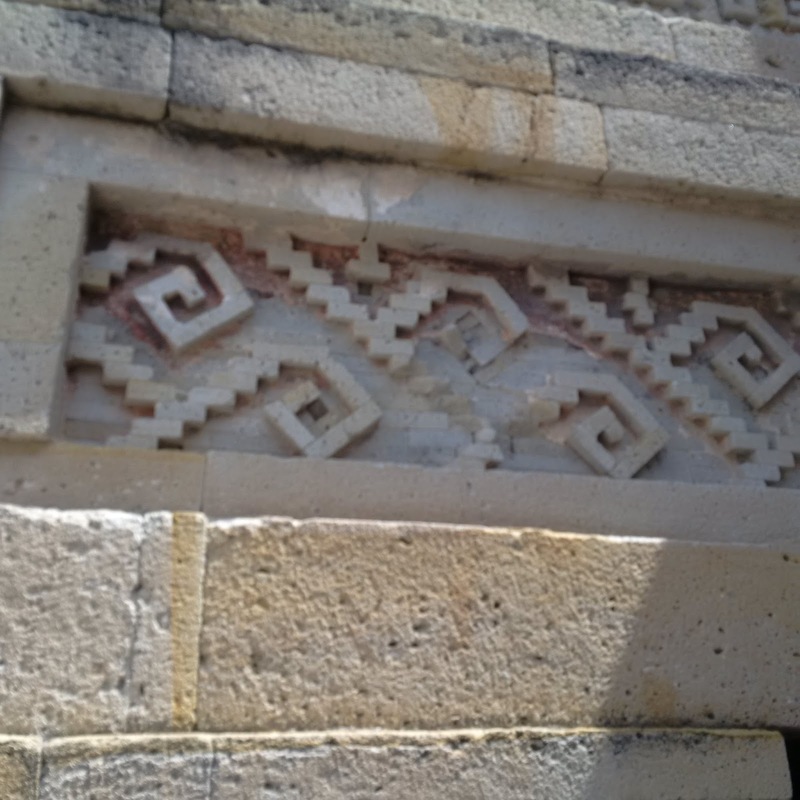 And in many of the carvings our guide said you could see all the small marks of Zapotec indigenous handiwork. Around the sides stand large guard towers so the monks could keep an eye on their slaves. In the first motifs of Christ crucified the Dominicans would not show him suffer on the cross as they were worried this would lead the indios back to an apparent fondness for human sacrifice. Back then there were only crosses sans nasty suffering of the lamb of god. This much of the success of the conquistadors. I asked our guide but were there rebellions or uprisings at that time? They can get... they got into our head.